This is a custom reproduction lighting fixture designed specifically to match a client's antique chandelier. We loved it so much we added it to our catalog! The swooping 'S' arm leads the eye downwards to an acid etched hexagonal glass. Perfect for over a sink or in pairs beside a vanity mirror or anywhere you feel comfortable placing it. 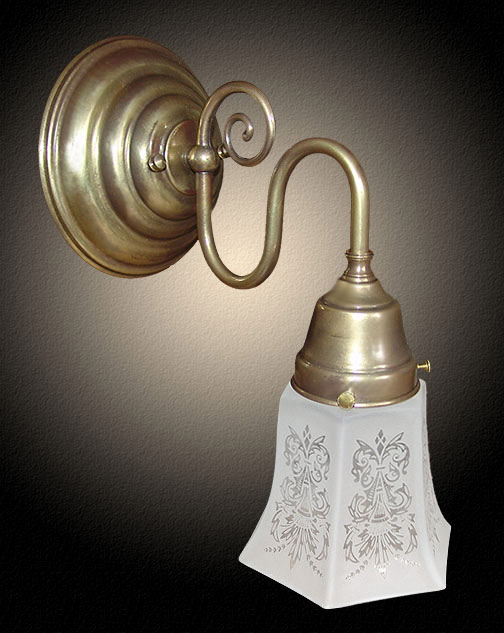 As with most of our sconces, many custom options are available including adding more arms to the design and alternate metal color and glass. Shown in Light Antique Brass. Available in different Metal Finishes, different Glass, Back Plate, multiple arms and many other Custom Options. Width 5.5 In. / Projection 10 In. / Depth 10 In.